October 7, 2008, at 12 pm a press conference organized by the Melina company will be held for informing the media about the Markovo Tepe Mall project as well as officially laying the foundations of the building. Pariticpants in the press conference will be Iakov Niv (manager of Melina company, investor of the project), Manuel Manuelian - chief architect of the building, Metin Gyurel - manager of the Intertek construction company, Pavlina Nikova - partner in Forton International. 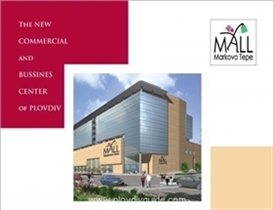 Markovo Tepe Mall Commercial and Business Center is an investment of 65 mln Euro and will provide about 1000 new jobs. The building of the mall will feature underground parking facilities in 4 levels, spa and fitness center, leading world brands stores, restaurants, cafes and entertainment facilities, as well a business zone with offices.